The following items are available for you to download in PDF format. To open and view them on your computer you need to have the Adobe Reader software installed. Good luck! Children's tour of the Portencross Castle educational display. 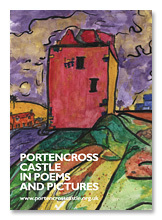 Portencross Castle in Poems and Pictures: written by parents and children of West Kilbride Primary. 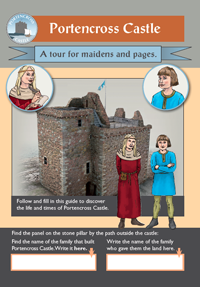 Family learning activities at Portencross Castle: suggestions for your family trip to the castle. The history of Portencross Castle: the full story of the castle and how it has changed over the years. Birds around Portencross Castle: an introduction to spotting birds around the vicinity of the castle. The Spanish galleon near Portencross Castle: explore the mystery of the sunken galleon just off the coast. Geology around Portencross Castle: an introduction to the fascinating geology Portencross. The Architecture of Portencross Castle: a guide to the changes in shape and features of the castle over the years. 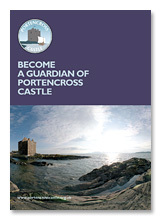 A New Life for Portencross Castle. Charting the conservation work to preserve the castle and open it to the public. A Social History of Portencross: a look at the people of Portencross and how they have survived. Portencross - a Seafaring Stronghold: the story of the link between Portencross Castle and the sea. 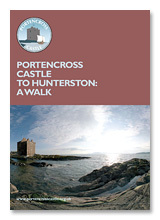 Portencross Castle to Hunterston: A walk: a self-guided walk to Hunterston - its history, wildlife, natural features. Castles at war: a primary school taskcard. Drama at the castle: a primary school taskcard. Eat, drink and be merry: a primary school taskcard. Mapping castles in Scotland: a primary school taskcard. Medieval timeline: a primary school taskcard. The rise and fall of castles: a primary school taskcard. Round the castle: a primary school taskcard. Scottish castles research: a primary school taskcard. Training for the knighthood: a primary school taskcard. Working in the castle: a primary school taskcard.